East Coast/West Coast/North Coast: The Italian Pizza Kitchen: Washington, D.C. The Italian Pizza Kitchen: Washington, D.C.
You might not think that a transportation conference would inspire great food. But thanks to the Transportation Research Board’s 2014 Annual Meeting in Washington, DC, I found one of the best pizzas that I have tasted in the year to date. My friend Bob and I needed a place to eat dinner between two meetings. After learning a reliable Irish pub near the convention had a long waiting list, we started foraging. 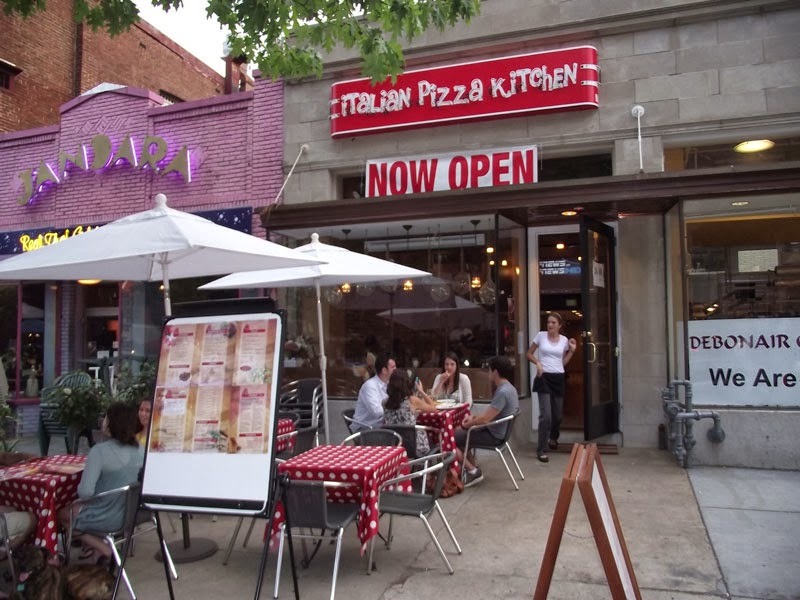 On the west side of Connecticut Avenue, a few blocks south of the Smithsonian National Zoological Park, we found the Italian Pizza Kitchen. The restaurant was well-attended but not crowded. As the interior photograph below shows, the dining room is intimate without feeling jam packed. The furniture, paint scheme and decorations feel like Italy. The Italian Pizza Kitchen has a wide variety of appetizers, pizza slices, pizzas, salads, Paninis, sandwiches and entries, all at reasonable prices. The place definitely serves beer and wine and may serve mixed drinks. Our waitress was capable and attentive but not overbearing. Our meals arrived quickly, which was appreciated with the deadline for the next meeting, but were cooked just right. Bob ordered a roasted eggplant pannini and I ordered a personal pizza with sausage and green peppers as the toppings. Both meals were tasty and appealing. Bob said his panini "was very tasty and I really liked the bread." Although the personal pizza is suggested as a meal for one, its six slices and 10 inch diameter means the average eater may have a slice or two leftover. But, that is what a doggy bag is for. The pizza had a crust that was thicker than the Neapolitan pizza favored in the New York metropolitan area but thicker than a Chicago or Sicilian pizza. With this thickness, the crust was crunchy on the bottom, not soggy on the top and was light and airy in between - - like good Italian bread. The tomato sauce nicely balanced sweet, savory and spicy. Best of all, neither the crust nor the rest of the pizza was greasy. 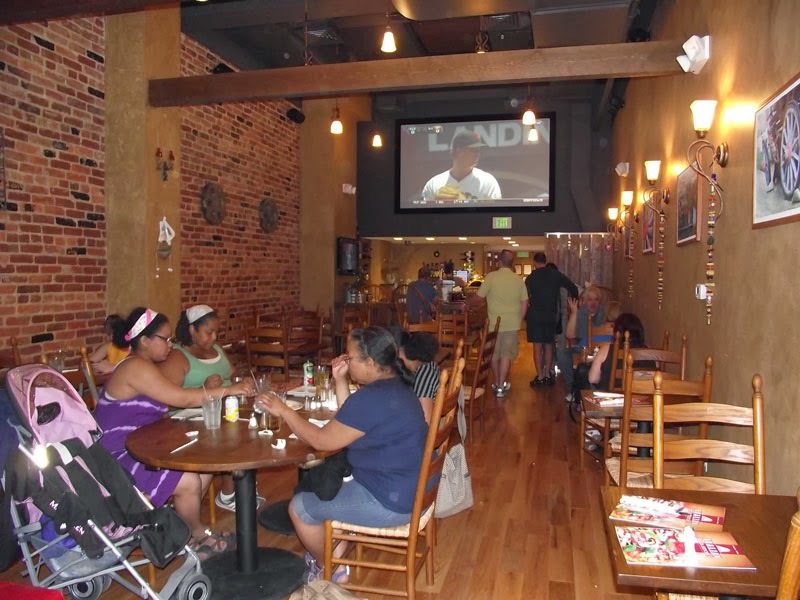 We dined at the newest of the Italian Pizza Kitchen’s two locations: 2608 Connecticut Avenue, NW. But with the capable, welcoming staff, comfortable décor and delicious food, the place felt like it had been in business for generations, not the several years it has been open.